It’s time to finish out the garden. Permanent Rose + White is used for the pink Hollyhocks. It makes a crisp, bright hue perfect for these happy flowers. A little Magenta is added for the darkest shade. The greens for the foliage are mixes of Pthalo Blue + Hansa Lemon Yellow. The Cadmium Yellow mixes are for the cheery Black Eyed Susans. I paint the flowers “forward”. The blossoms are blocked in starting with the group of Hollyhocks nearest the door. The yellows are painted next, followed by the Hollies in the foreground. 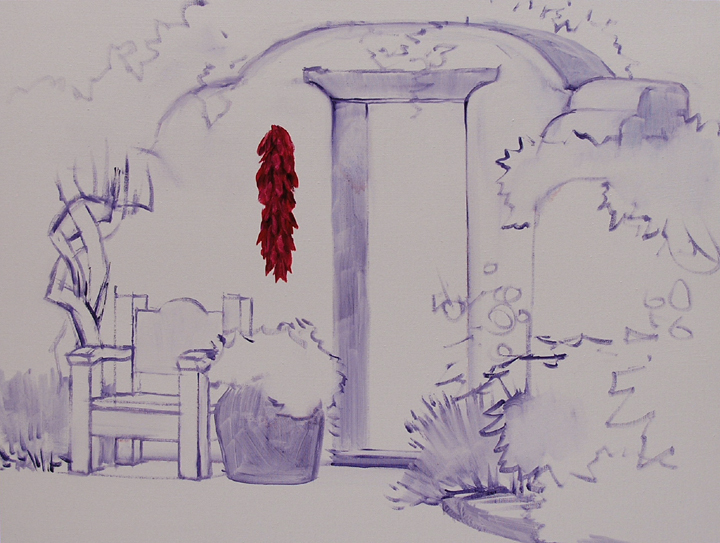 The foliage is now painted following the same back to front sequence. 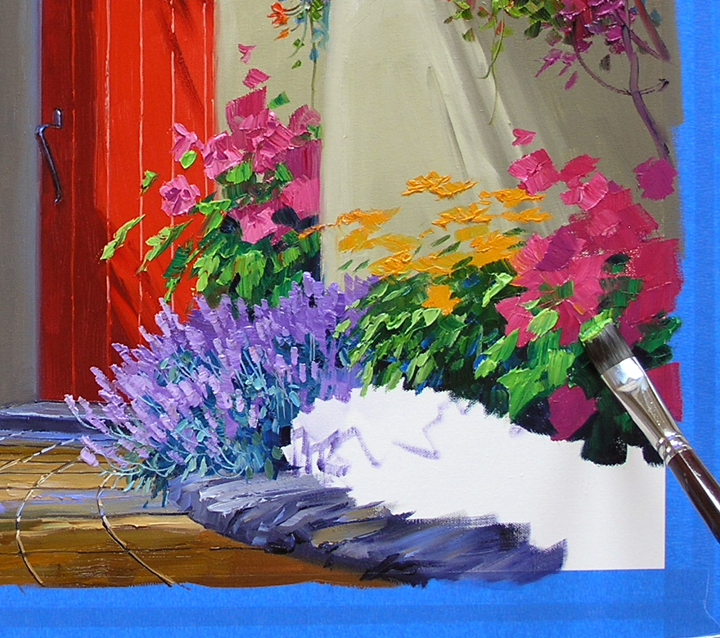 Since I put the Lavender in previously, I have to carefully paint the greens around the purple blossoms. In a perfect world I would have blocked the Lavender in at the same time as the rest of the flowers in this bed. However I had the colors out when I painted the Lavender by the bench so I worked on these at the same time. Adding the centers begins to define the individual flowers. 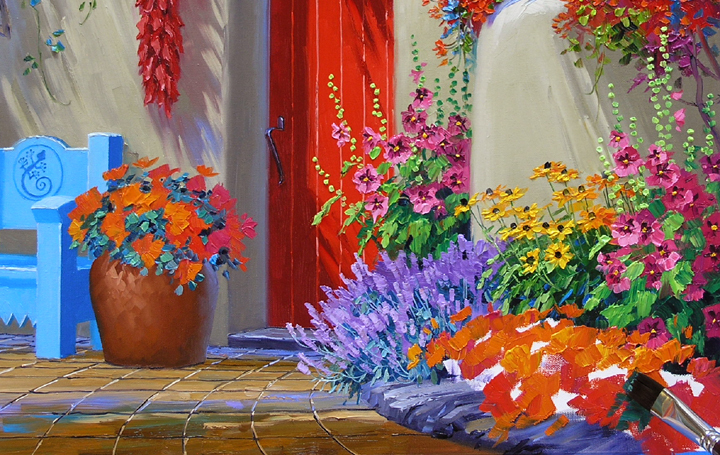 The highlights on the petals of the Black Eyed Susans are “Laid” on the canvas using the corner of a Bright brush. I like the extra texture and dimension the thick paint adds. Seed pods finish out the Hollyhocks. 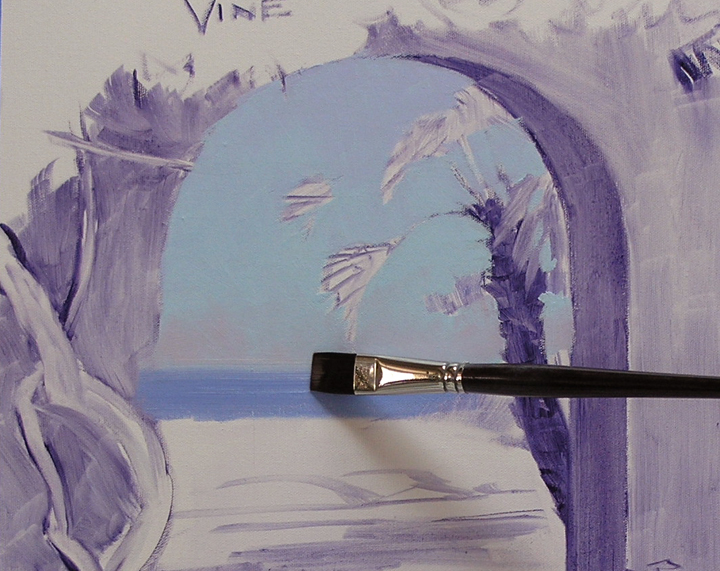 A #2 Filbert brush is just right for applying the heavy paint of the round pods. Some of the Hollyhock pink is used for blocking in the California Poppies along with Cadmium Orange and Cadmium Red Light. The leaves are painted with color left over from the foliage of the Lavender. 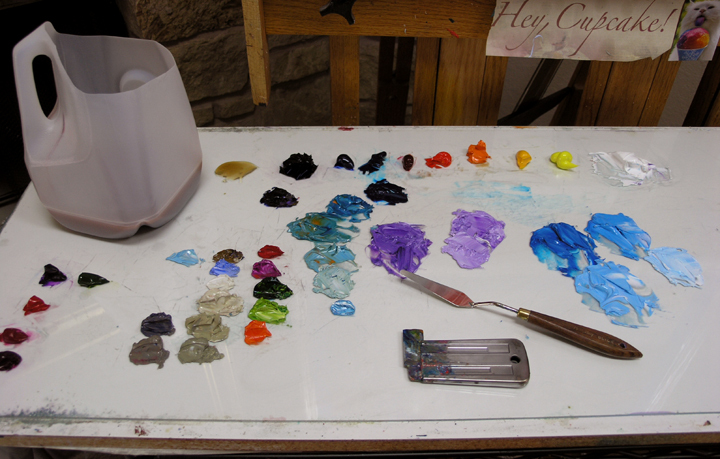 Thought you’d like to see how my palette is set up. The mixing surface is a piece of 1/4 inch glass on a white shelf board. 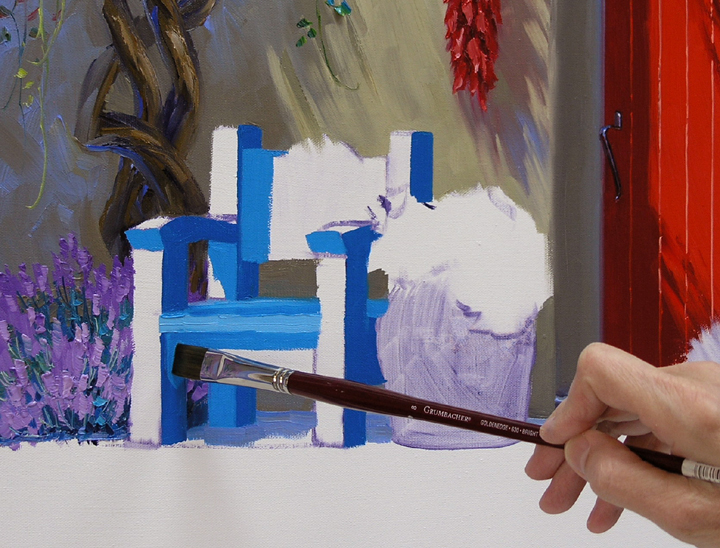 This way our paints look the same on the palette as they do on the white canvas. The base is a culinary cart with wheels. The two shelves are ideal for holding all my paint and miscellaneous supplies. The roll of tissue is essential. I wipe my brush often as I paint. 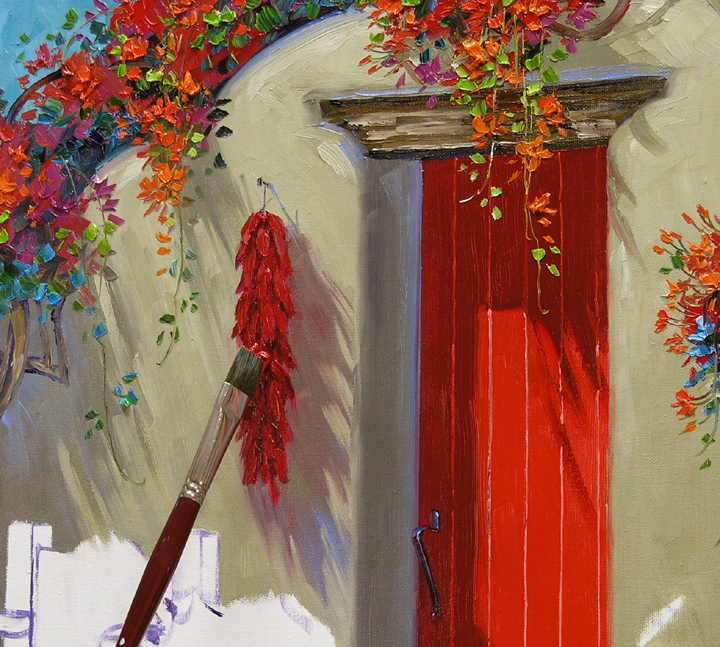 A clean brush is the secret to crisp, bright color on the canvas. We don’t use paper towels because you tend to hold onto it too long, then end up getting paint everywhere but on the canvas. With the tissue I make one or two wipes and throw it away. The satillo tile floor is painted as if it were a plain flat surface with the sunlight streaming across. A shadow is cast over the entire front edge of the painting. We call this a “THRESHOLD”. Think of being outside of a brightly lit home on a cool evening. When the door is opened your eye is drawn through the darkness, over the “THRESHOLD” of the door to the warm light inside. This works the same in a painting. 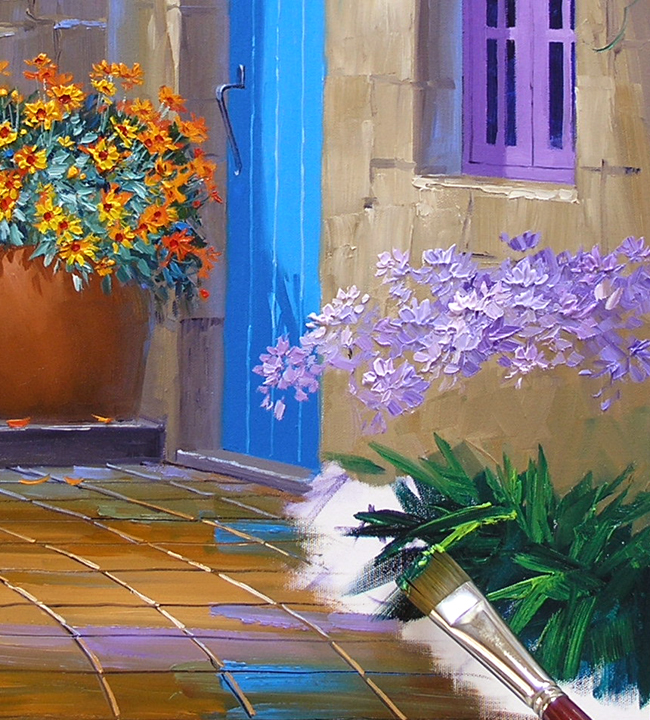 The viewer’s eye is drawn into the painting over the shadow, or Threshold, in the front. This technique gives depth in a painting and works really well in landscapes. 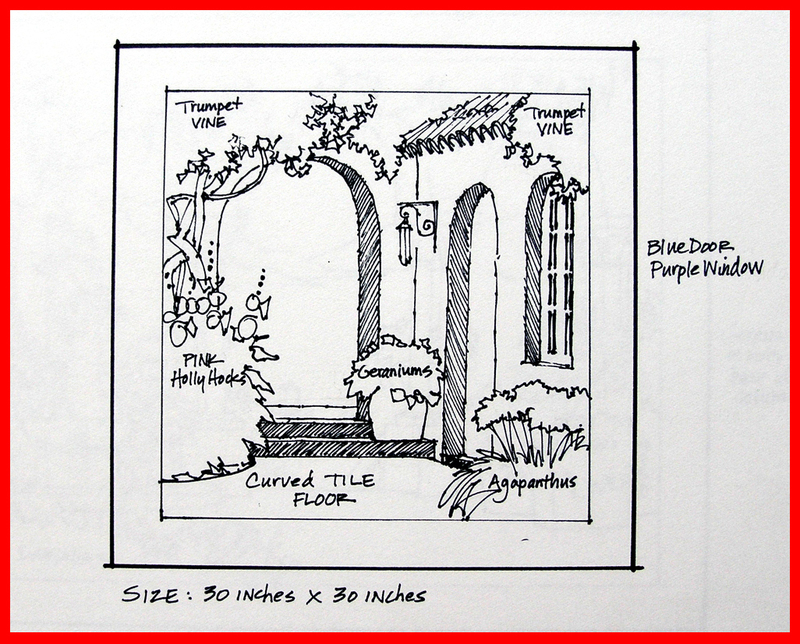 The curved perspective lines of the tiles are drawn into the wet paint with a fine liner brush. 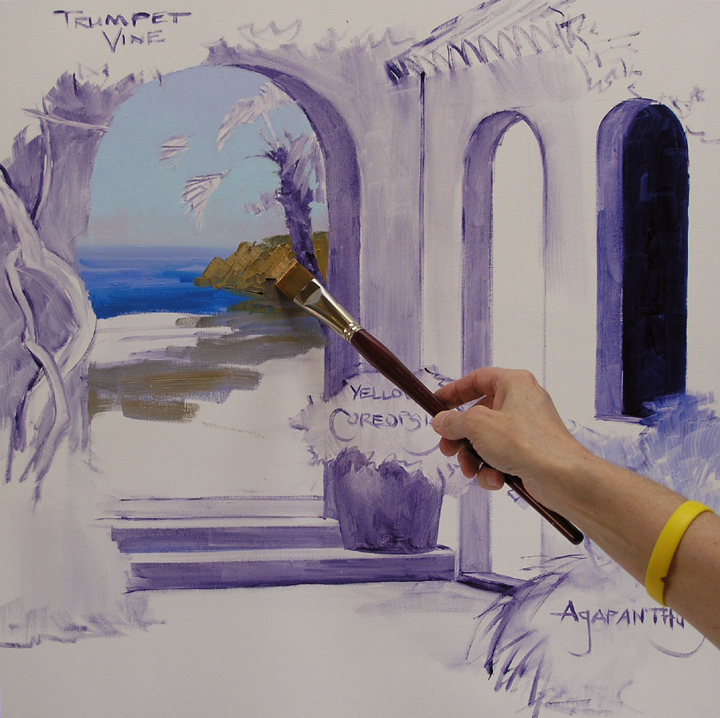 I do this freehand, using the mahl stick would limit my movement and I couldn’t make a smooth line. Next the horizontal lines separating the tiles are made using the same brush. If you would like to receive an email every time I publish a new post you may subscribe to my blog. CLICK THIS LINK and scroll to the upper right side of the page. You will see a heading EMAIL SUBSCRIPTIONS. Just enter your email address and click the button “Sign me up!” It’s easy. 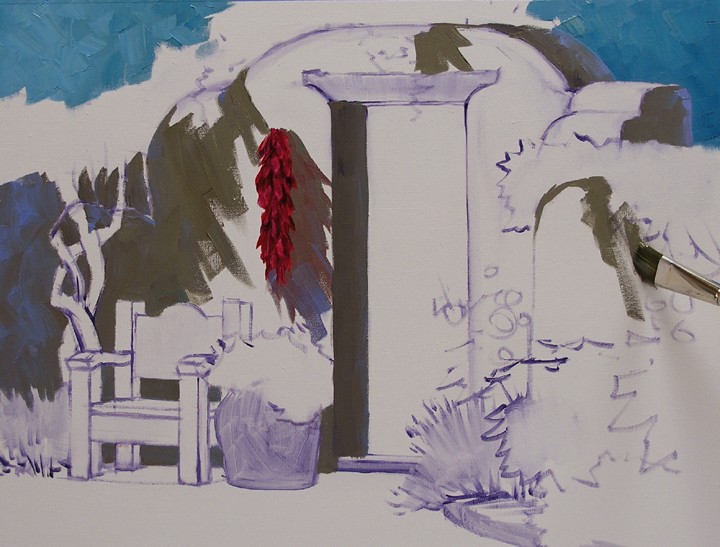 The flowers of the Trumpet Vine are now blocked in. Magenta, Cadmium Red Light and Cadmium Orange, in various combinations and proportions, are used for the blossom colors. 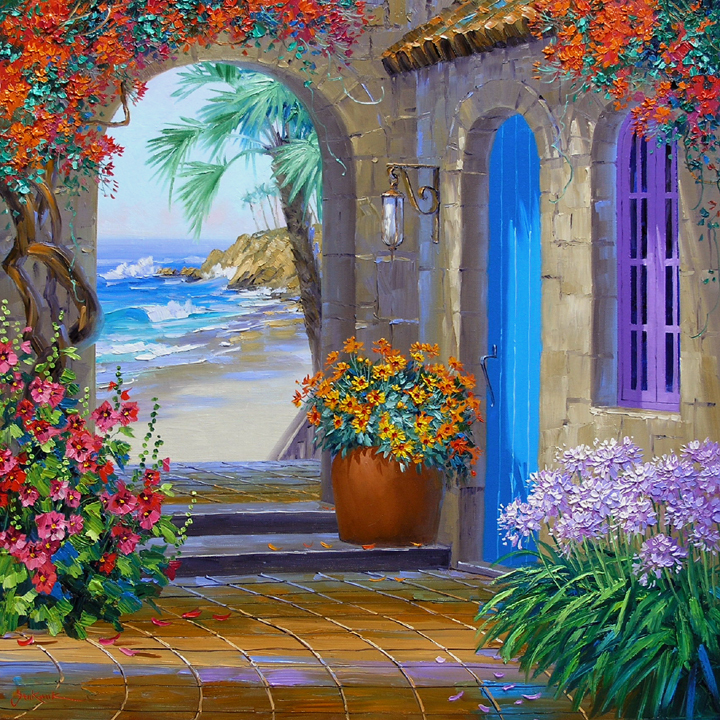 The flowers are painted first, then the greens of the foliage are worked around the oranges and reds. This sequence allows the color of the blossoms to remain crisp and clear. If the leaves were blocked in first, my brush would pick up some of the green as I worked on the flowers, muddying their color. 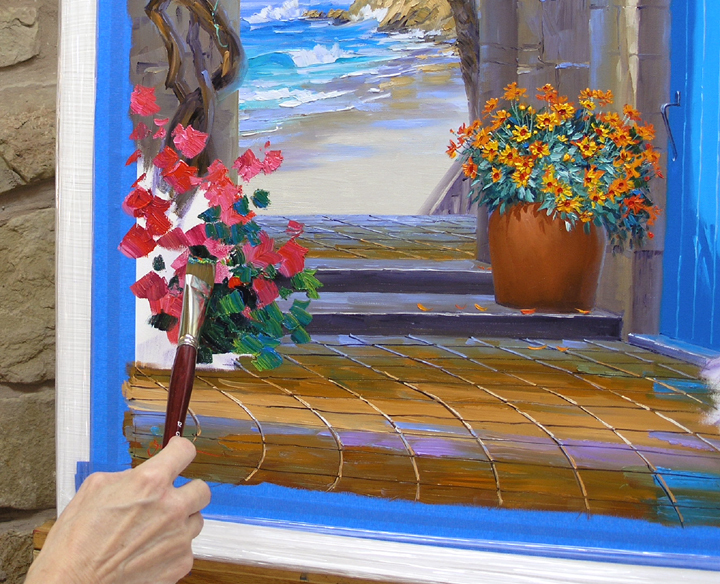 The pure Cadmium Orange highlights of the Trumpet Vine flowers are added last. 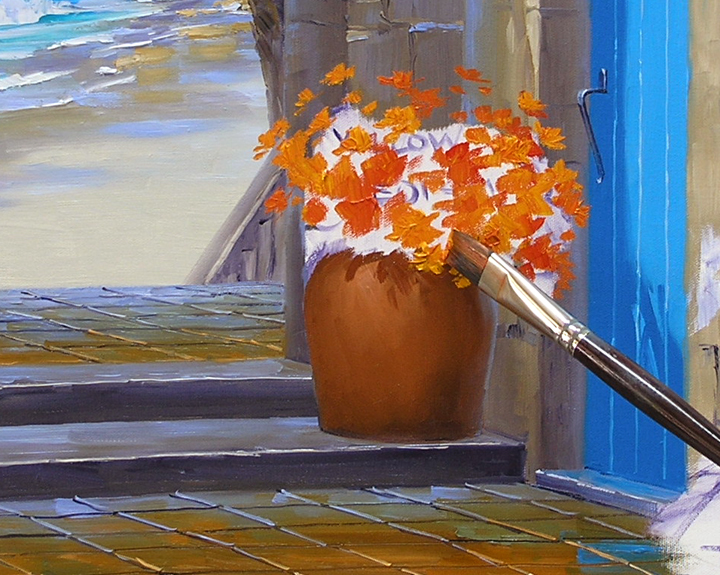 The thick paint is “Laid” on the canvas with the corner of a Bright brush. I have to be careful not to pick up any of the color underneath. To see this better just enlarge the image by clicking on the picture. 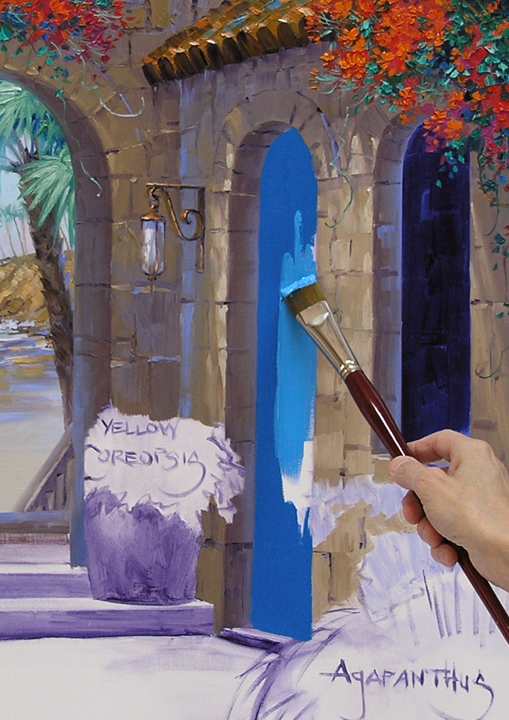 The same technique of “Laying” the color on the canvas is used for the ristra. Using the corner of the brush I’m able to almost sculpt the shape of the individual chili peppers with the thick paint. 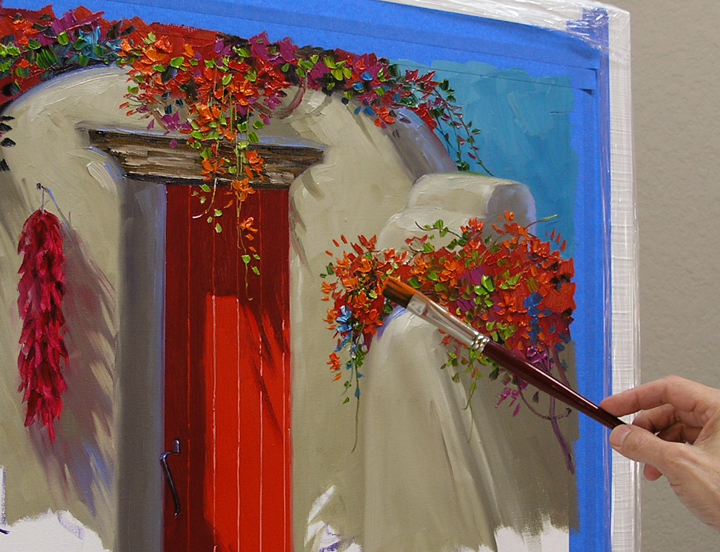 Many people think I’ve used a palette knife to apply the color but all of the work is done with a brush. My colors are ready for the Southwest Bench. 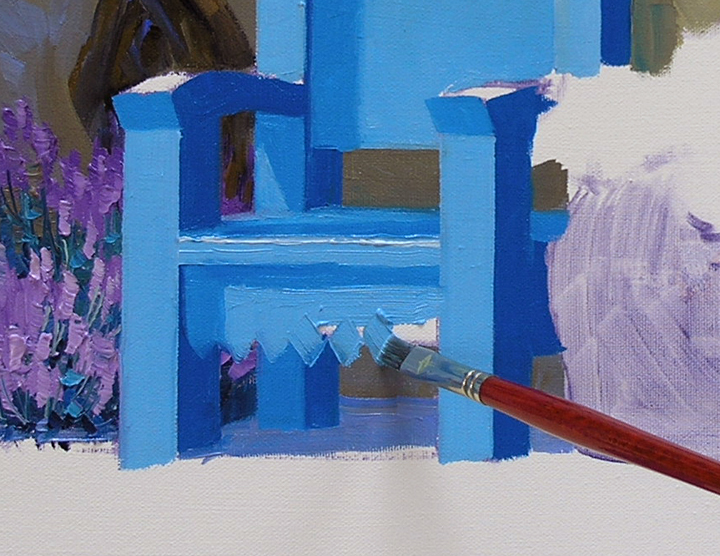 The blues are made from Pthalo Blue + White. The lavender mixes, for the flowers beside the bench, are made from another special color we use, Dioxazine Purple. The Lavender is painted before the bench since it grows behind it. I always try to “Paint Forward”, working on the most distant objects first. Only when they are complete do I move forward. 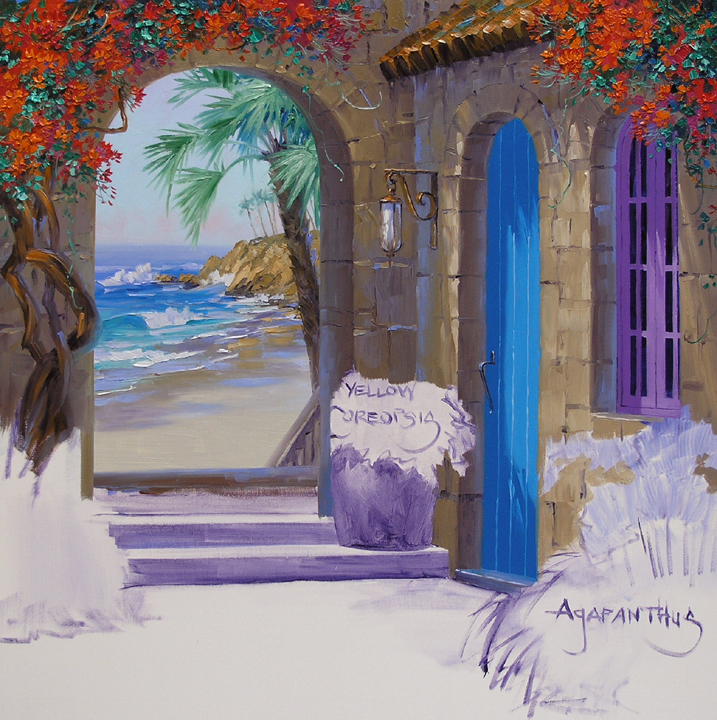 Like in this piece, the background was painted first, then the wall. 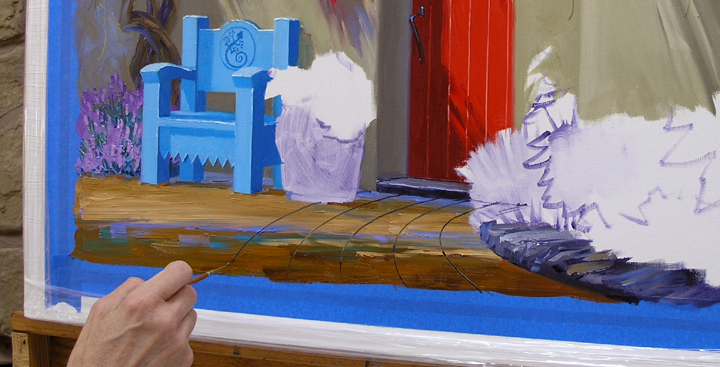 Now the shadows are blocked in on the colorful blue bench. 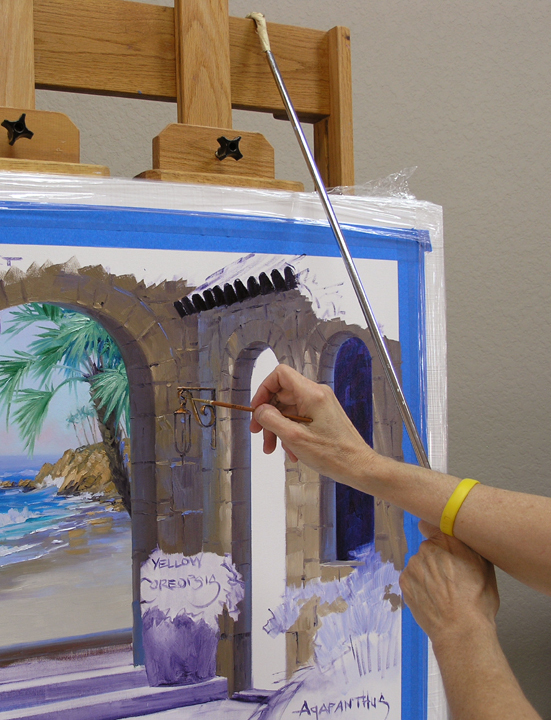 To make the zigzag along the bottom edge I use a #2 Bright brush. The square brush is held at a 45 degree angle, perfect to make the triangle shape in one stroke. Our collector who commissioned this piece teaches art! So I’m going into a little more detail than usual because she will use my blogs to instruct her class. Now, let’s get to painting. 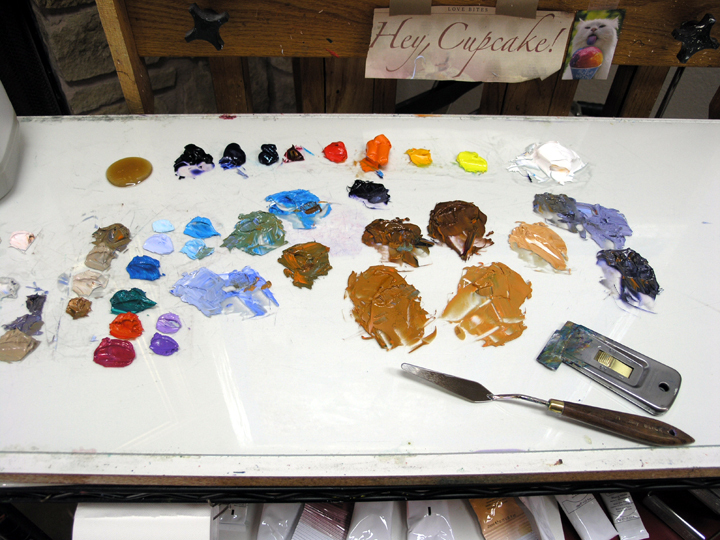 The mixes for the adobe building are laid out on my palette. I’m using a little different mix than I showed you in the previous blog. Varying proportions of MUD + Cadmium Orange + a tiny touch of Pthalo Blue + White make several shades of a soft taupe. 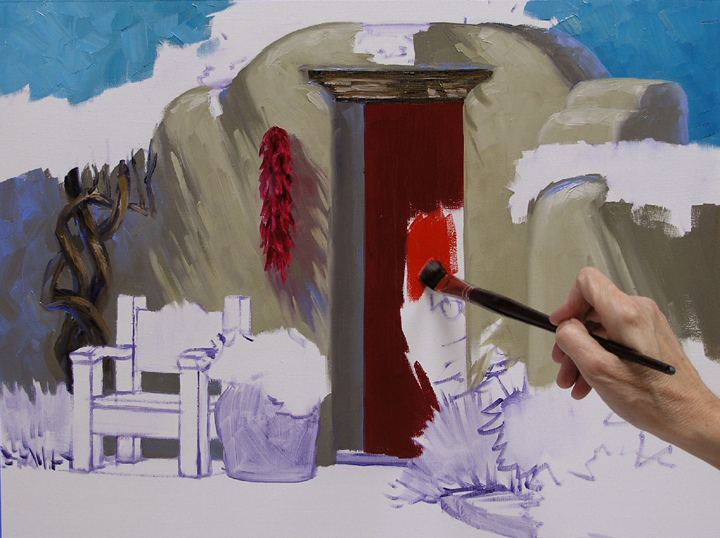 This gives an imperceptible greenish tinge to the adobe that will make the red door glow. Red and Green are complementary, across the color wheel from each other. Placing complements next to each other makes them appear more vibrant. 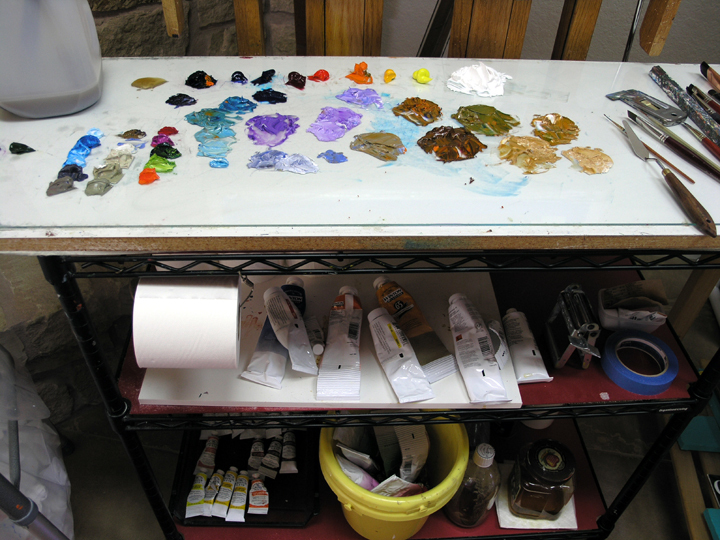 The blobs of paint on the left are the colors for the background, mixtures of Cadmium Orange + Pthalo Blue + White. The light comes into the piece from the left, so the distant blue-greens are lighter on that side, gradually getting darker moving across the canvas to the right. After the background is complete the shadows on the adobe are blocked in. 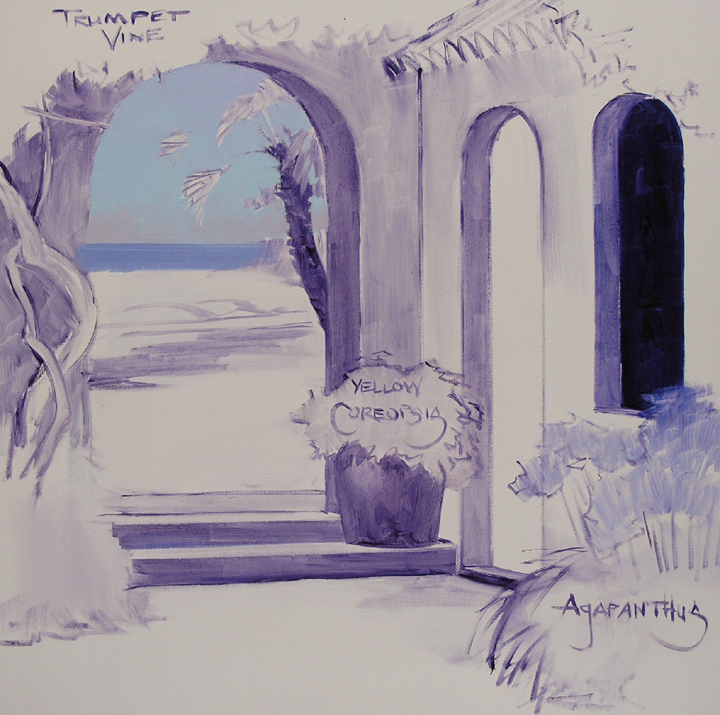 A few strokes of blue are painted into the dark adobe beneath the Trumpet Vine on the left to add coolness in the shadow. The light areas on the wall are now painted. Notice the shadow cast by the chili ristra. A little bit of red from the peppers is reflected into the shadow. You can see this better by enlarging the picture, just click on the image. 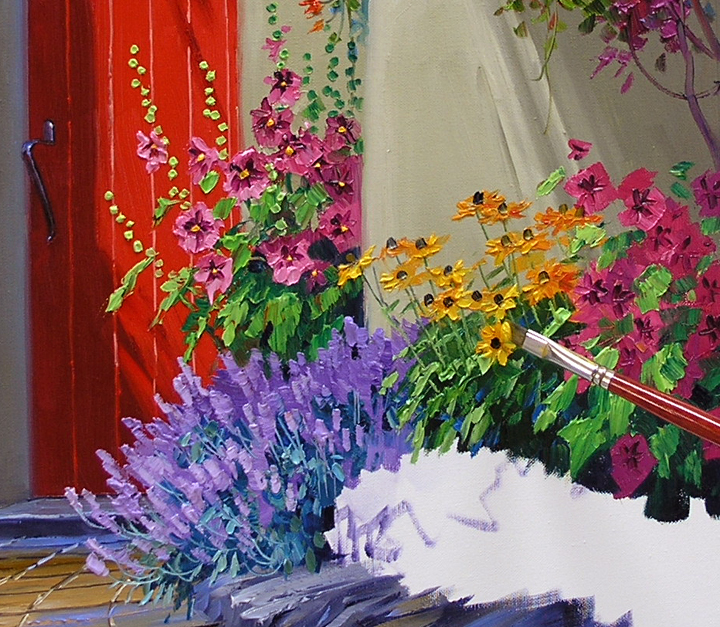 A couple of special colors, Cadmium Red Deep + Magenta, are used to paint the shadow of the red door. This mixture makes a clean, deep red that I’m just not able to make with our Double Primary Palette. 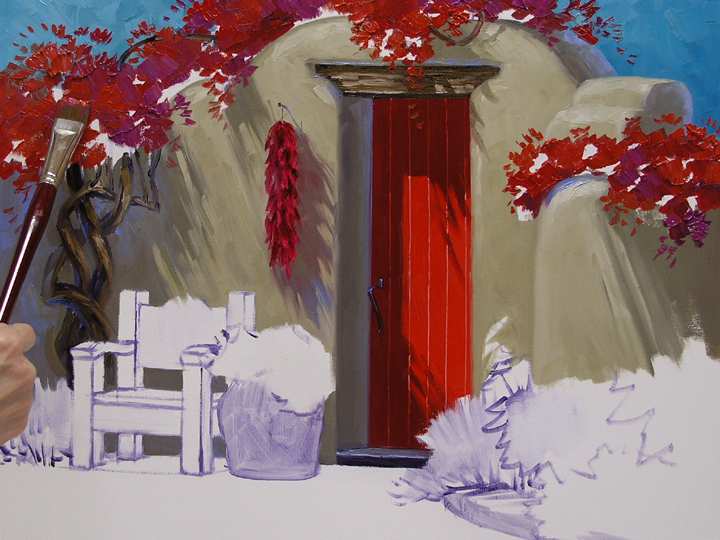 The sunlit portion of the door is pure Cadmium Red Light. To draw the lines separating the individual planks of the door, I rest my arm on a Mahl Stick to steady my hand. 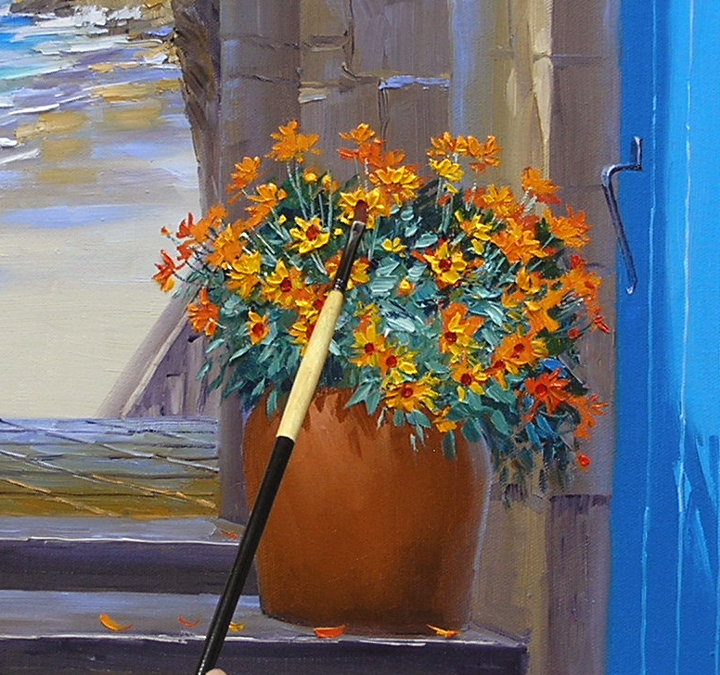 One end of the Mahl Stick has a hook that goes over the top of the easel. The other end rests against my palette. To learn more about this essential tool CLICK HERE. 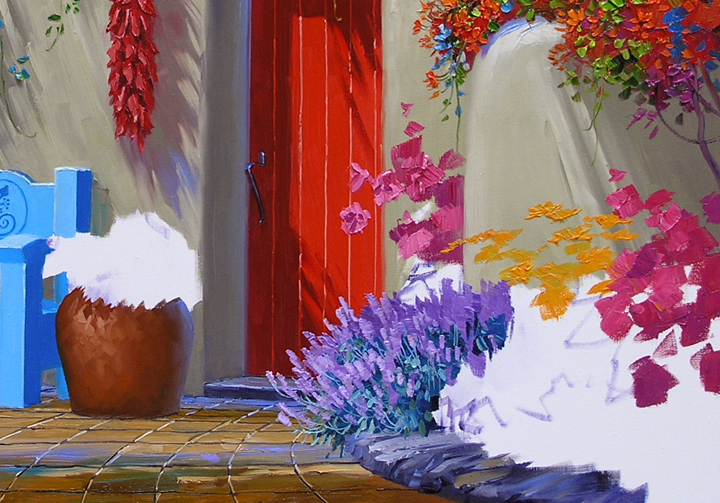 Jack has a new article published on Fine Art Studio Online. To read The Event CLICK HERE. Today I’m beginning a new commission. 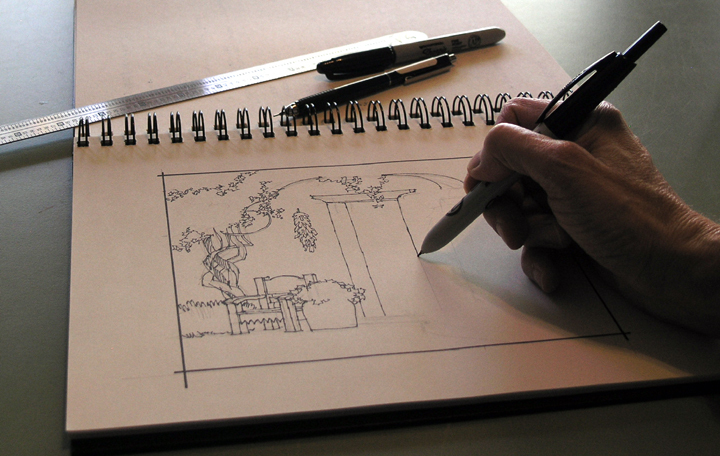 The first step is to make a pen and ink sketch of the basic elements. This is done for almost all of my paintings. An outline, proportionate to the final size, is made on my sketch pad. 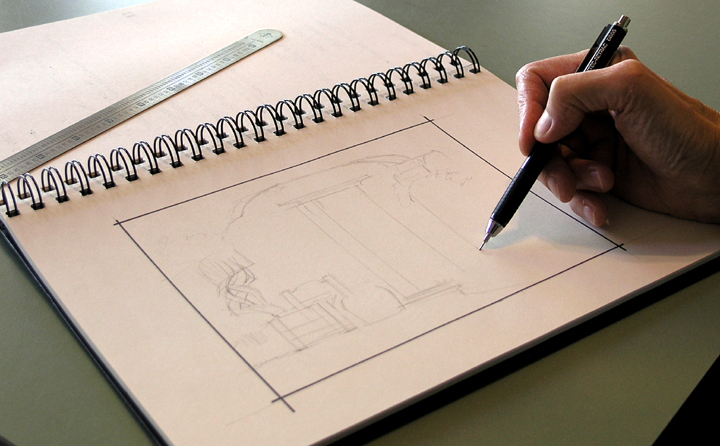 Then a few guide lines are lightly drawn in with a mechanical pencil. To see the image enlarged, just click on the picture. Next the sketch is inked in using a Sharpie pen. Here is the finished sketch. It serves as a “Road Map” for me to follow as I paint. Many times I get so caught up in painting I forget what goes where. With the flowers labeled I stay on track. 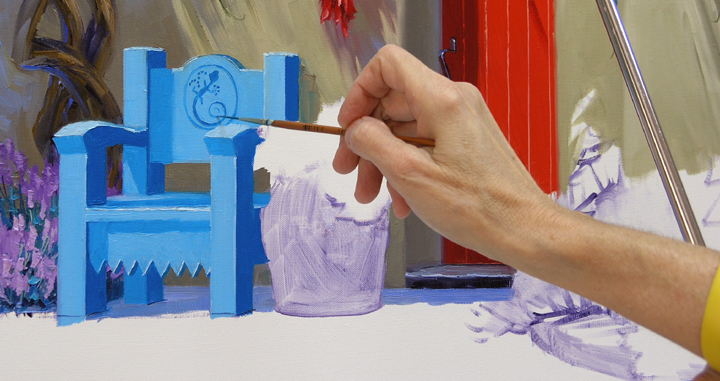 Now, let’s get to the easel. You can see my painting setup above. 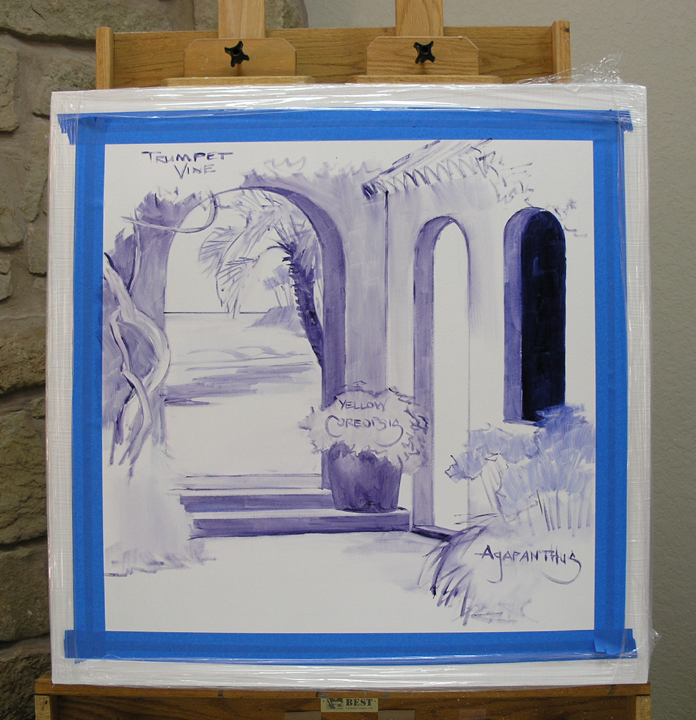 The canvas has a white frame that is covered with blue painter’s tape. This keeps the frame clean, when I’m completely done with the piece the tape is pulled off. 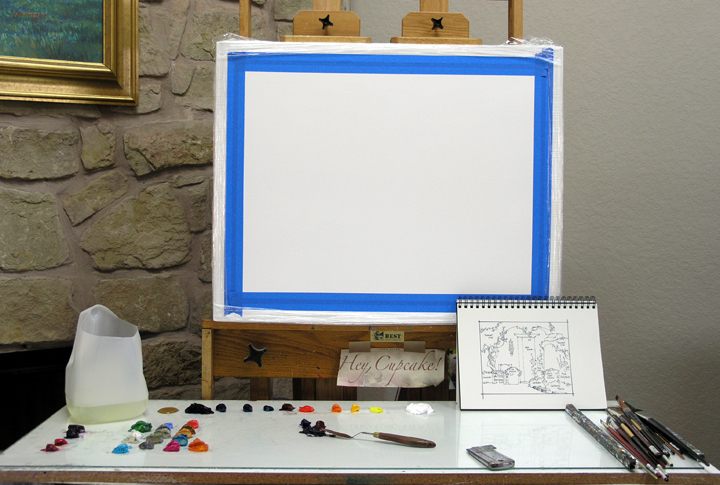 My basic paints are laid out at the top of the palette, directly under the canvas. The colors lined up on the left side are leftover from the previous painting. I’ll use them in some of the mixes for this piece. The plastic container is a gallon water bottle with the top cut off, leaving the handle. It holds odorless paint thinner. When it gets a bunch of yuck in the bottom, I can pour off the good thinner into a new container. Then the gunky stuff is disposed of. Using a #1 Filbert brush dipped in a mixture of MUD (Ultramarine Blue + Alizarin Crimson) + a liberal amount of Liquin I begin sketching the image on the canvas. Michele loves Pink Hollyhocks and so do I. One of the reasons is the name is just so cool. These stately plants were originally called Hock Leaf. A salve made from the leaves was used to reduce the swelling in horses’ hocks, the large joint on the hind leg. A special color we use occasionally, Permanent Rose, mixed with White is perfect for these flowers. 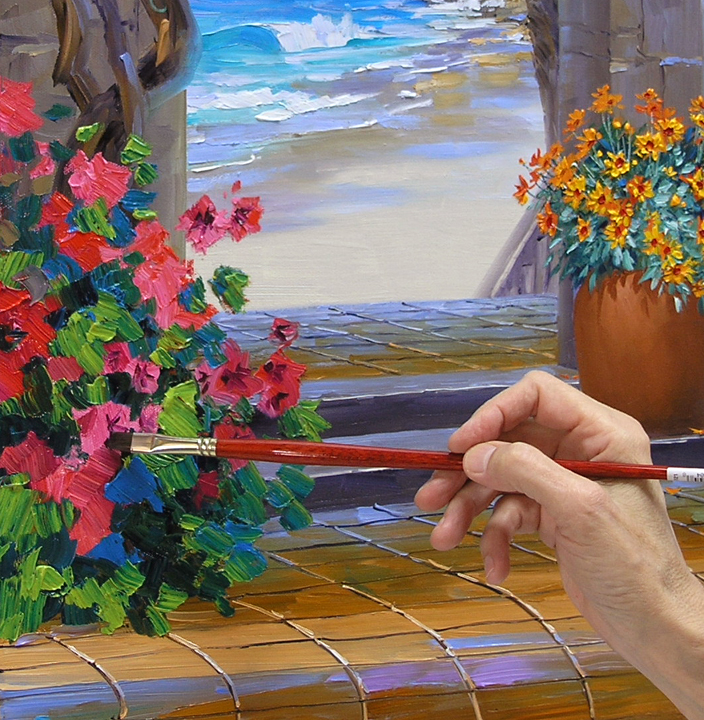 Cadmium Red Light is added to some of the pink to make a few of the blossoms more of a coral color. After the leaves are painted with warm greens, made of Ultramarine Blue + Cadmium Yellow Medium, the dark centers of the Hollyhock flowers are added. Tall stalks with seed pods and yellow stamens finish out the happy Hollyhocks. A few pink blossoms drift to the ground in the gentle breeze from the ocean. The Agapanthus is an intriguing plant also known as the “Lily of the Nile”. We first saw them in California. The fluffy bunches of flowers range from a deep Blue-Purple to a soft, almost white, Lavender. The blossoms are painted first, followed by the strap-like leaves of the foliage. I don’t know about you but I’m ready to walk down the steps to the beach and wiggle my toes in the soft sand. Maybe even take a refreshing dip in the surf. Who knows? 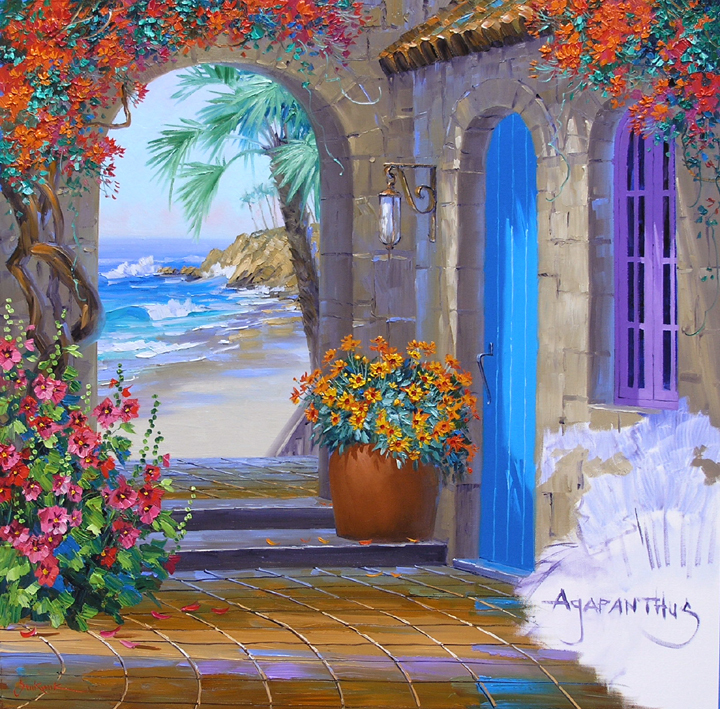 Coastal Retreat is ready to add a breath of ocean breeze to my collector’s home. They’ll just have to be careful not to track sand in the courtyard when they return from the beach! Hummingbirds are also flying through on their migration south to Mexico. Jack counted a dozen circling and feeding at the four stations we have around the back courtyard. 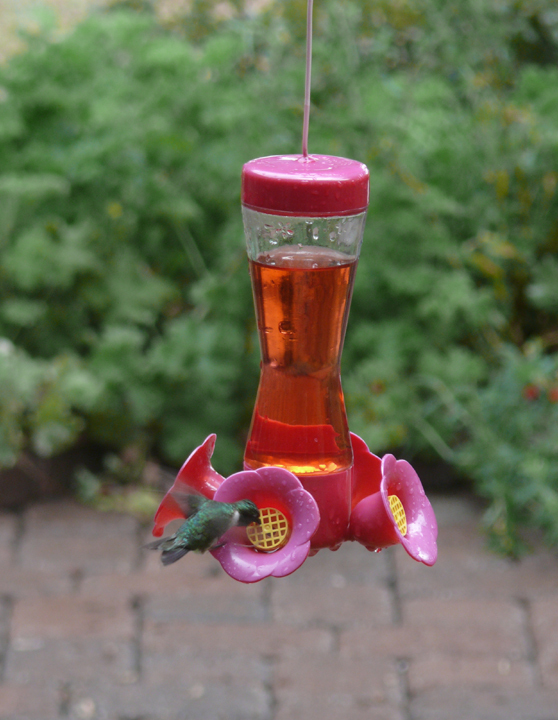 I tried to get a picture of several at once but this little guy kept chasing all the other hummingbirds away. No matter what feeder I went to he would chase everyone off. We have four feeders and he was trying to protect all of them. I guess he knew I was taking pictures and wanted to be the Star. Or maybe he just wants the food all for himself! Michele had seen some Coreopsis in another piece I had done and asked if I could replace the Geraniums in the sketch with some of the cheery, yellow flowers. No Problem! These are such fun to paint. 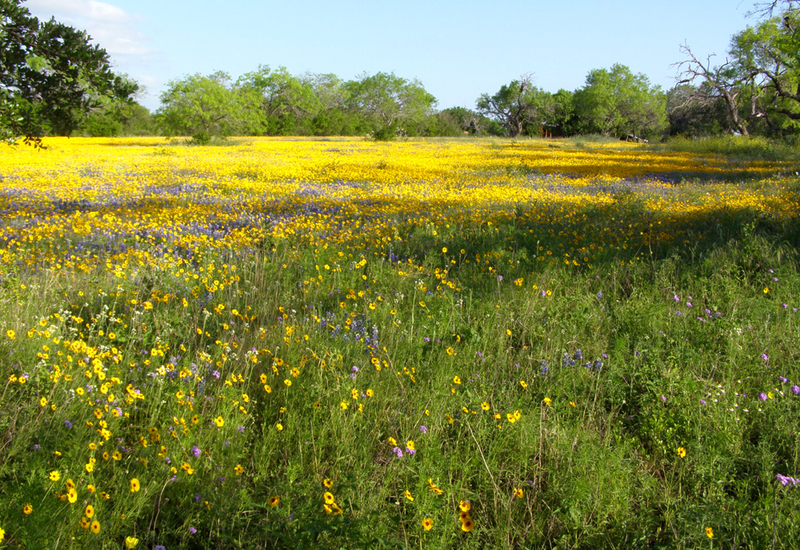 The mixes for the Coreopsis blossoms range from Cadmium Yellow Medium + Cadmium Orange to Cadmium Yellow Medium to Cadmium Yellow Medium + Hansa Lemon Yellow. Next the foliage is worked around the yellow of the flowers. A soft, sage green is made from various combinations of Pthalo Blue + Cadmium Orange + White. 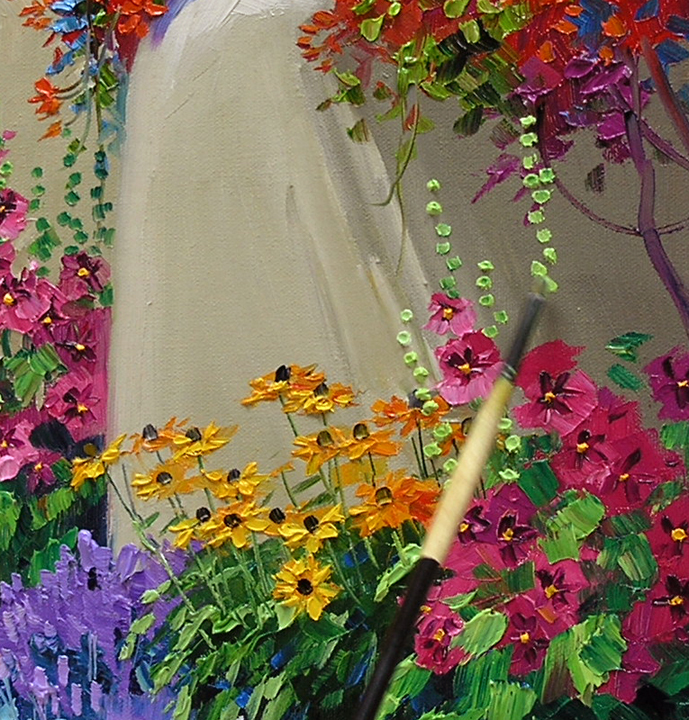 The flat side of the Bright brush is used to block in the large areas of color, the corner makes the details of the leaves. After drawing in the stems with a fine liner brush, the highlights on the flowers are painted. 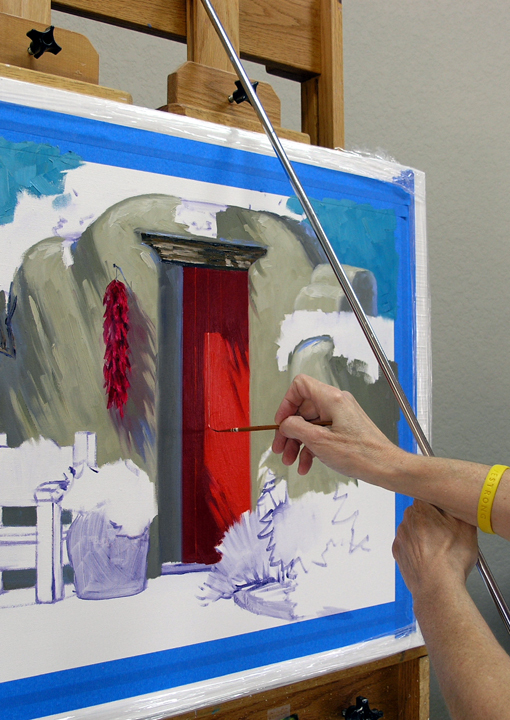 Using a #2 filbert the paint is “laid” on the canvas, taking care to not pull up any of the color underneath. 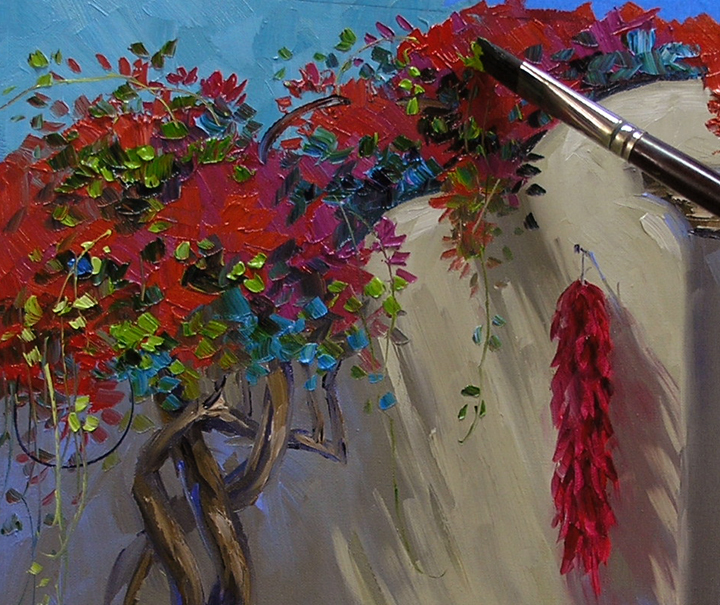 I like to add the light on the individual petals with really thick paint, giving the blossoms a lot of texture. 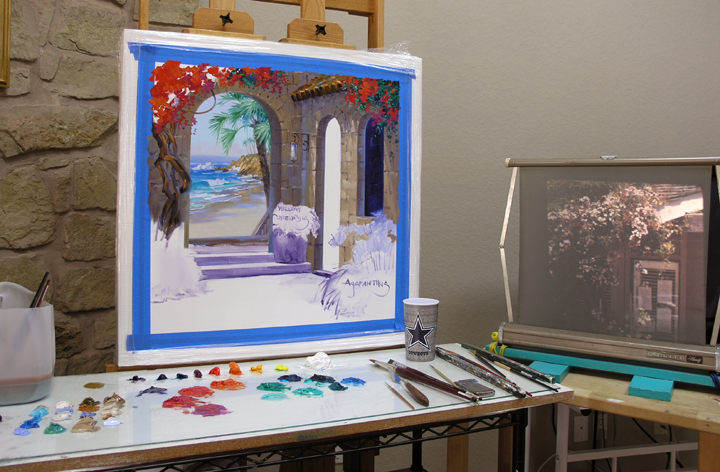 The centers of the Coreopsis are added with the same brush used for the highlights. Fall is around the corner, bringing an end to our hot summer. One of my favorite happenings this time of year is the annual migration of birds. We get many transient visitors; some stay a day or two, others several weeks. 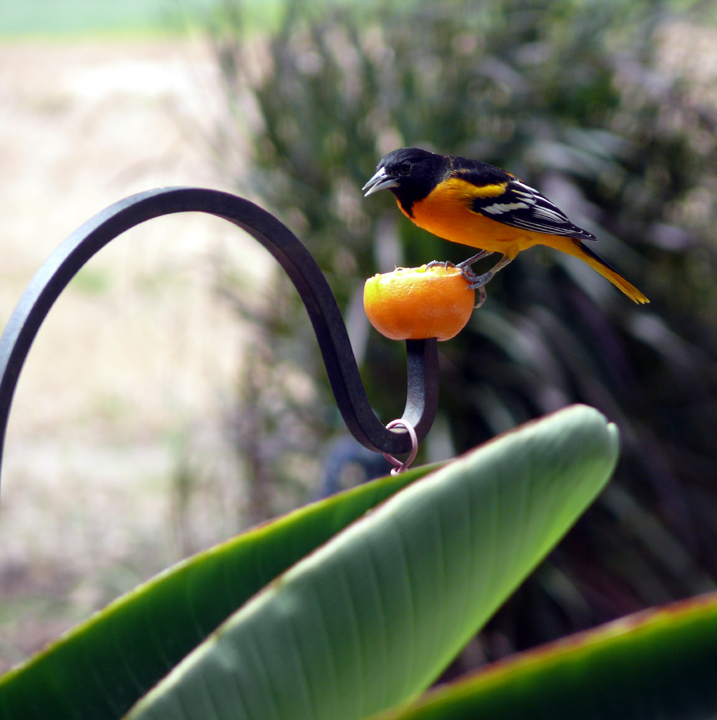 Jack and I have never seen this fellow, a Baltimore Oriole, here before so we are pretty excited. He doesn’t look a bit like the Baltimore Orioles we’ve seen at Baseball Games, I keep thinking he should have a tiny baseball helmet and bat! If you’d like a closer look, just click on the picture. Today I’m working on the terra-cotta tile floor. 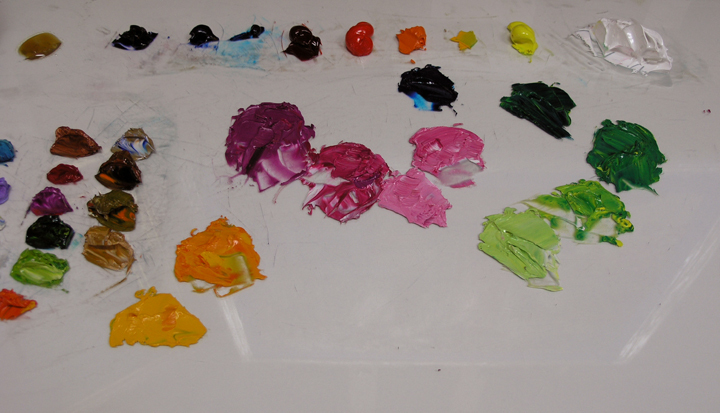 The colors in rows on the left side of my palette are left over from previous painting sessions. 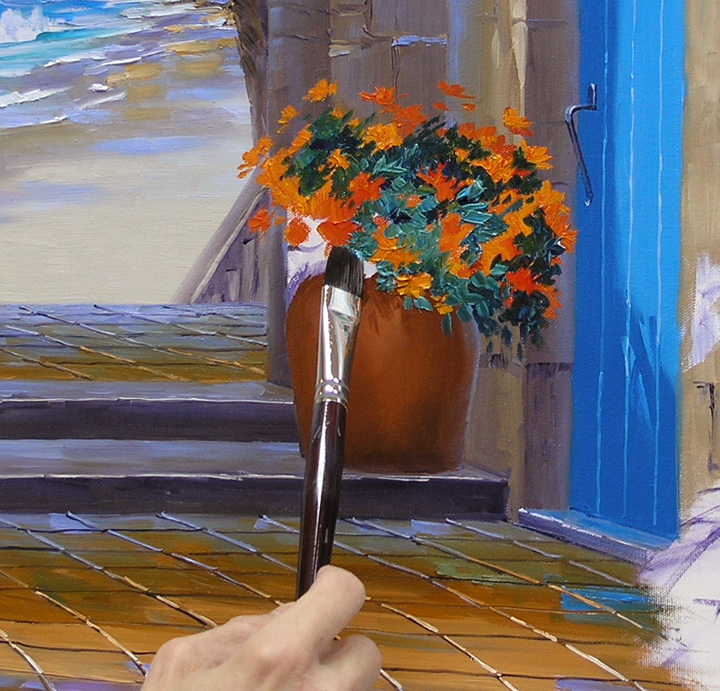 The basic tile color is mixed from Cadmium Orange + MUD + a tiny touch of Pthalo Blue. White is added for the lighter shades, more MUD is mixed in the darkest ones. A few blues are pulled out from my left overs to use in the floor. The shadow patterns are painted first. Notice how much cooler, or bluer, the patio beyond the steps is. This makes it recede. The light area where the sun streams across the floor is now painted in. 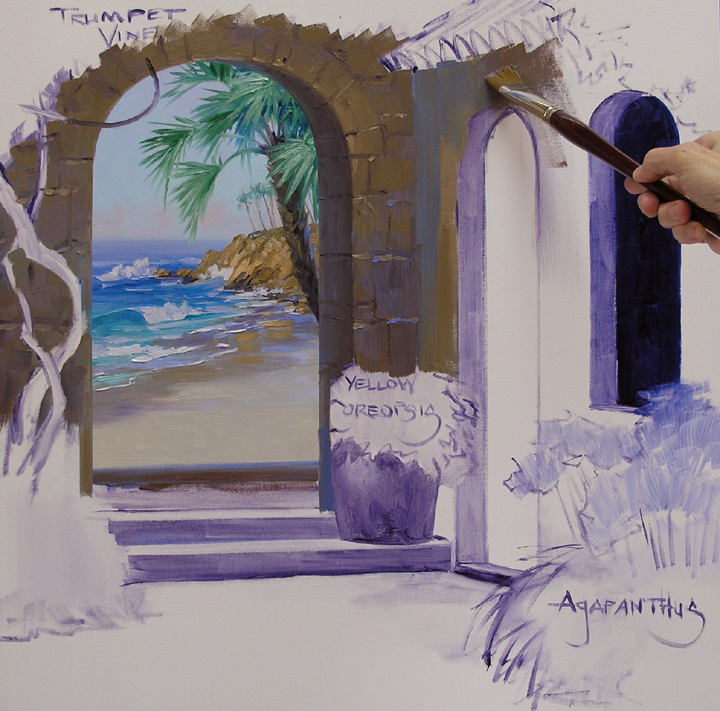 The curved perspective lines are drawn into the wet paint with a fine liner brush. This is done freehand. 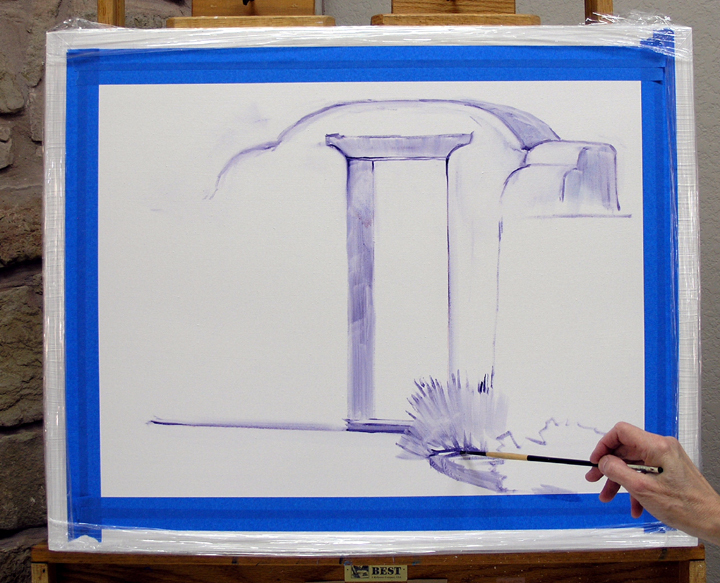 Using a mahl stick would limit my movement and I couldn’t make a smooth line. To visit my page on Face Book just CLICK HERE. If you would like to become a Senkarik FAN, just click the LIKE button at the very top of my Face Book page. Thanks. Yippee! We finally got some rain today. When it let up a bit we checked the rain gauge, 9/10s of an inch so far. It has started up again so who knows how much God is going to bring us. The level of Senkarik Pond is moving up a little so it looks like our fish just may survive those water birds. So let’s get to painting. 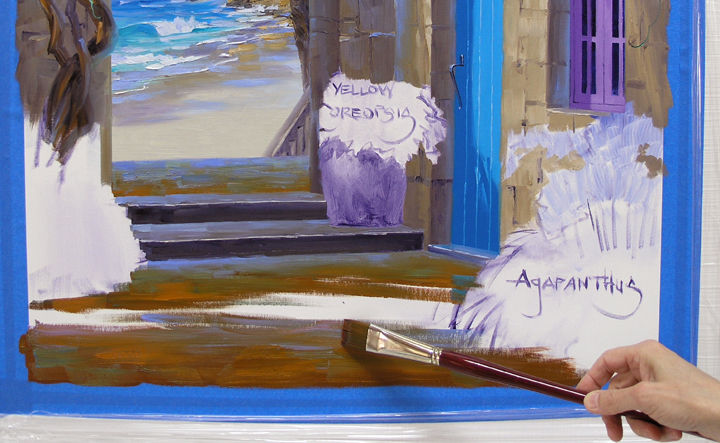 The distant water is a soft blue mixed from Ultramarine Blue + MUD (Ultramarine Blue + Alizarin Crimson) + White. 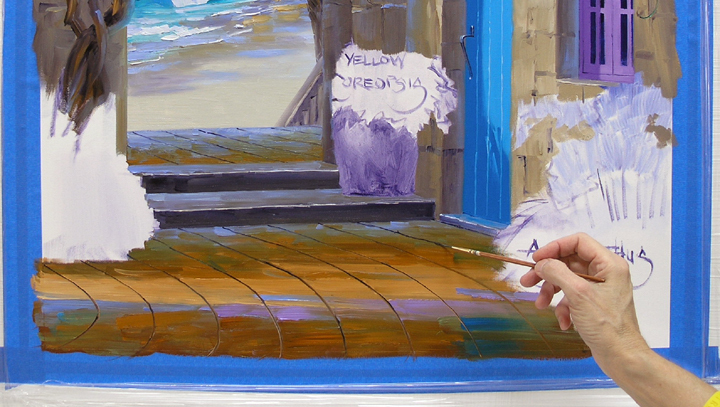 As the water comes forward the color becomes more intense, a mix of Ultramarine Blue + Pthalo Blue. 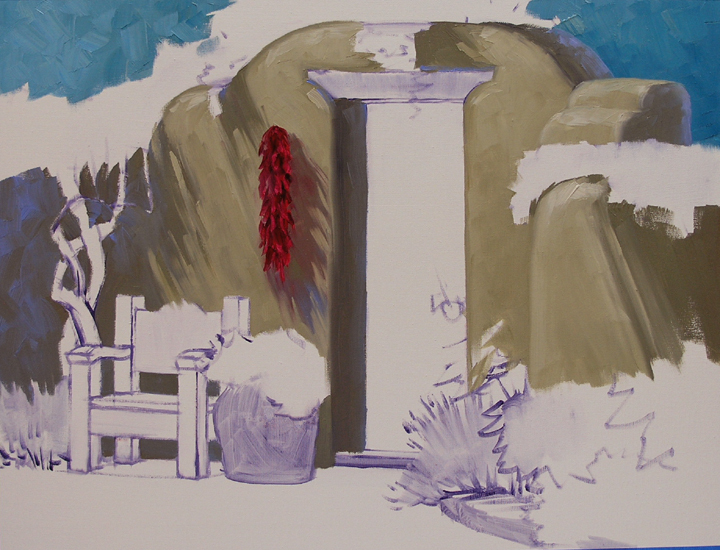 The sunlit bluffs are blocked in with my large Bright brush using paint leftover from the last piece. 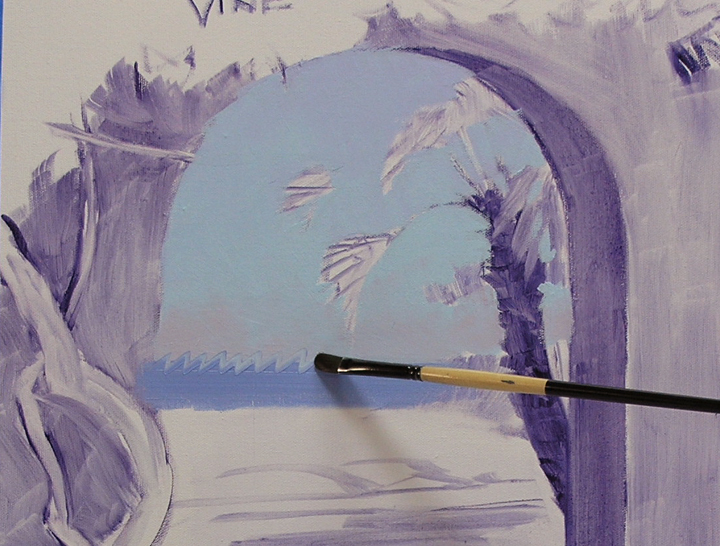 The same type brush is used to paint the palm fronds, rustling in the gentle sea breeze. Notice the wet sand on the beach, I’ve dragged some of the bluff color down to indicate reflections of the sun washed cliffs. 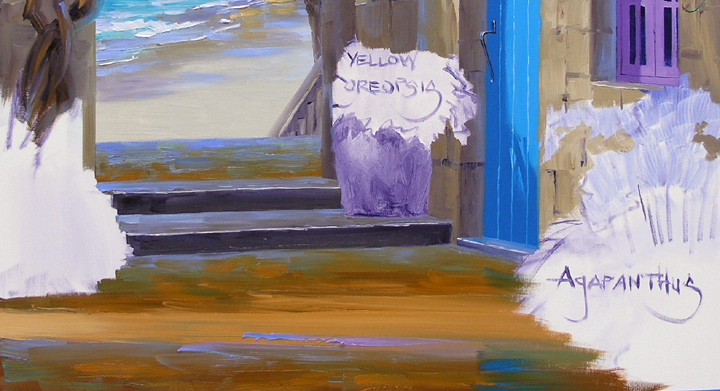 Various combinations of Ultramarine Blue + Cadmium Orange + MUD are mixed for the rock building. The most distant part of the wall with the door and window is made bluer so it will recede. Remember Cool colors go back, Warm colors come forward. 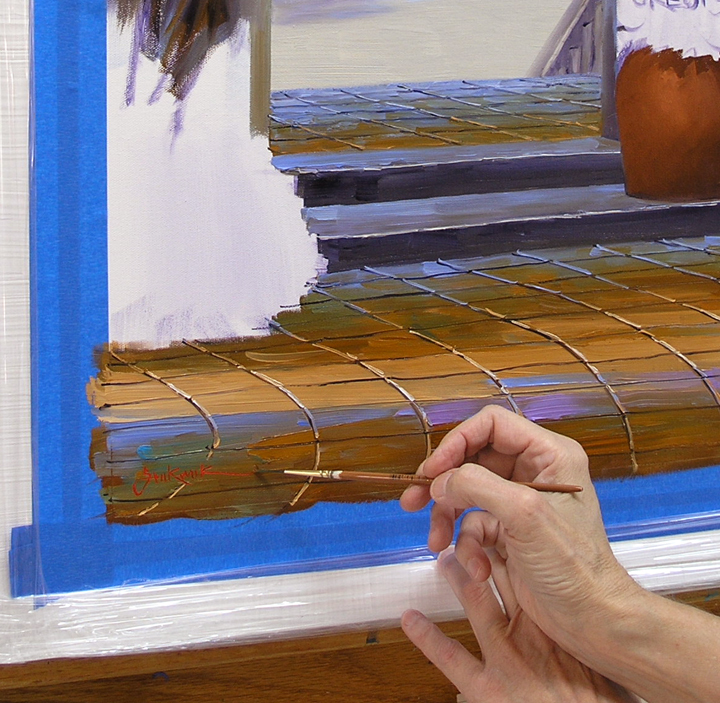 I brace against a mahl stick in order to steady my hand to paint the fine detail of the lantern. 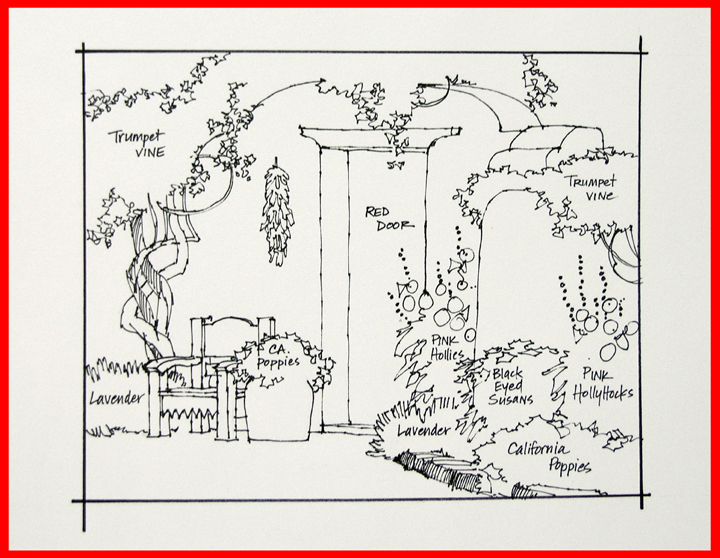 To find out more about using a mahl stick CLICK HERE. A rear projection screen is used to view our reference material on slides. The picture was taken at the Barnyard in Carmel. This is a delightful collection of shops with the most incredible gardens. A full-time gardener keeps it beautiful. When we lived in Pacific Grove this was one of our favorite places to go. Never did we see a flower out-of-place. 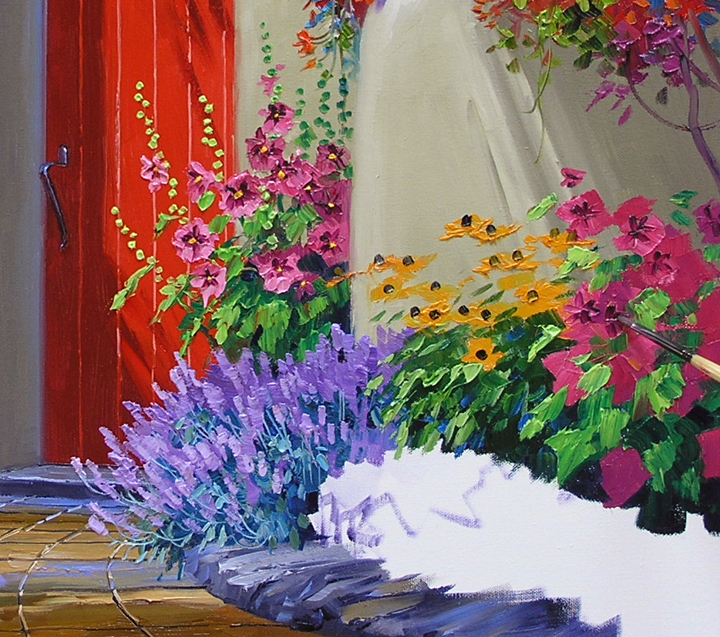 In the picture above I’m blocking in the orange vine, flowers first, foliage last. Using artistic license I’ve taken the liberty to change the color of the flowers from the original white to red-orange. In the image on the right the door is painted with mixes of Pthalo Blue + White. Jack and I are so fortunate to have such great collectors. They are certainly keeping me busy with commissions. Or, as we like to call them, collaborations. Michele and Dan first saw my work years ago. 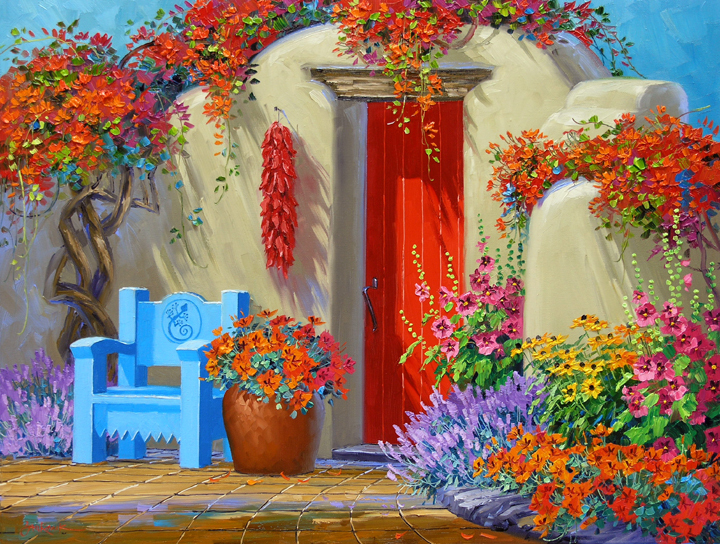 Recently they visited our Santa Fe Gallery and asked me to do a special painting for them. We talked over their ideas and I did the sketch above. 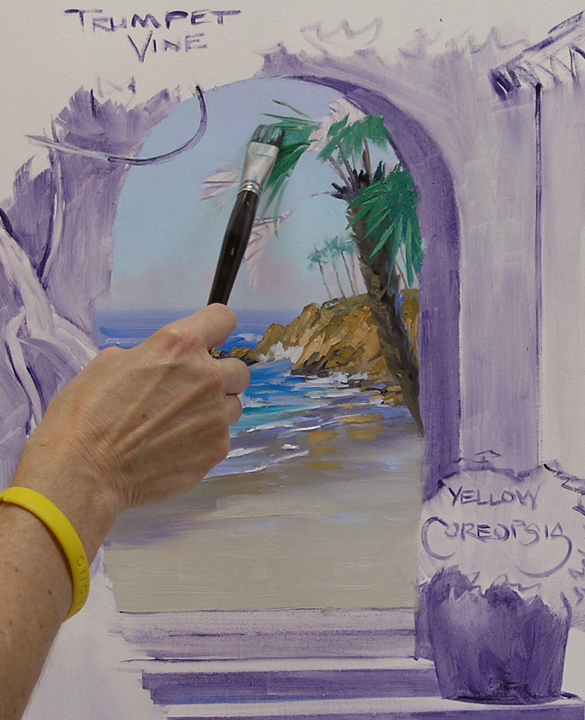 Michele wasn’t certain if she wanted a river or an ocean through the open arch so I left the area blank. When we had our Collector Event over Labor Day Michele and Dan came. She won my demonstration painting, a river scene! So, we’ll do the ocean on this piece. The basic elements are sketched on the canvas with a #2 filbert brush dipped in a wash of MUD (Ultramarine Blue + Alizarin Crimson) + Liquin. It’s a sunny day at the coast, without a cloud to be seen. The white foam on the surf will appear more prominent without the competition of light-colored clouds. The distant horizon line of the ocean is softened by moisture in the air. In order to make the hard edge soft I employ the following technique. First the horizon is dragged across the lower edge of the sky, making a hard line. A clean filbert brush is used to make a zigzag the full length of the horizon line. To see any of these pictures larger just click on the image. A wide, clean Bright brush is then pulled along the horizon line. This blends the zigzag, softening the hard edge. Now the distant ocean softly fades into the sky. Tomorrow I’ll begin on the bluffs and roaring surf. Meanwhile, back at the ranch the drought in Texas has really hit Senkarik Pond. Even though we have a well and pump into the lake we can’t keep up with the evaporation. 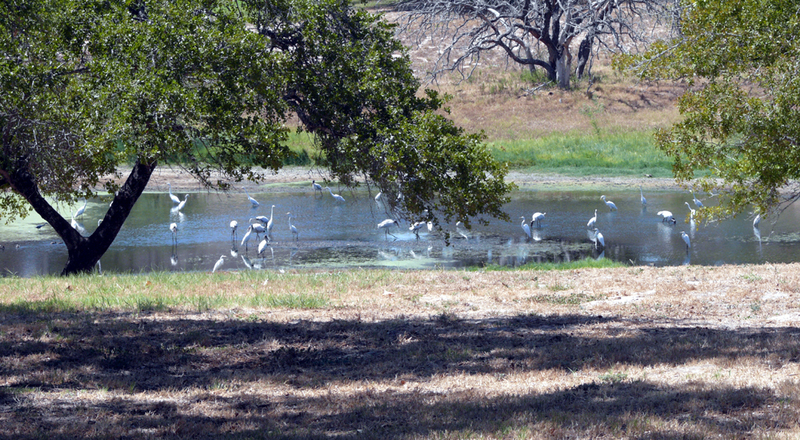 But the Great White Egrets, Blue Herons and Wood Storks are loving the lower water level. Last October we stocked our spot of water with fish. Click here to read more about that. But all those little fish are disappearing, our pond has become a smorgasbord for the local water birds! Sissie is a Happy Girl!